Below you will find notes on the changes from one release to the next. For a higher level view of what we have planned for the future, please see the Spine issues page. Fixed the positions of toast messages and the selected name. Added unpremultiply to the texture unpacker. Added Slot > New: Bone (creates a bone and moves slot under it). Fixed a second performance problem with the bone Create tool. Fixed texture packing with scale. Fixed blurry font rendering on some dialogs. Creating multiple skin placeholders for existing attachments keeps original visibility and uses a single undo state. JSON export no longer writes an empty default skin. Fixed hotkeys that show a dialog from causing a character to be typed in the dialog. Added tight packing of mesh polygons to the texture packer. Fixed export progress bar movement. Fixed welcome screen layout jumping when first shown. Added x and y coordinates for setup pose AABB in JSON and binary data. Don't show welcome screen if opening a project by double clicking a file. Fixed welcome "new" image when window is narrow. Improved welcome layout, more horizontal space for recent projects. Fixed scrollbars not showing sometimes. Welcome screen showing news, changelog, tips, links, recent files, and examples. Fixed width font for dopesheet frame text boxes. Dopesheet frame text boxes fit 5 digits. Trial intro animations and sign up. The Large font can use the Bitmap setting for more efficient rendering. Show "Restore" for maximize and fullscreen tooltips. Fixed loading some projects with an invalid clipping end slot. Fixed performance issue with Create tool. Fixed weights view slider not appearing. Fixed Rotate tool icon rotation when mesh vertices are selected. Fixed Auto Key not creating a key when pasting vertex positions. Fixed spacing for dopesheet rows for bones with no keys. Prevent keys from being pasted in setup mode. Added ctrl+alt hotkey (cmd+alt on Mac) to tooltip for key Offset. Fixed using key Offset via the hotkey so it can be adjusting multiple times. Fixed key Offset not adjusting curves correctly. Fixed crash when binding bones and choosing a linked mesh. Fixed Import Data when the data doesn't have a default skin. Fixed transform constraint Offset not auto collapsing for animate mode. Fixed projects that have a linked mesh with another linked mesh as the parent mesh. Fixed crash deleting a skin placeholder and keeping all attachments. Fixed open project error message. Improved temp file usage to not leave as many files behind. Improved display support on Linux. Fixed bones not drawn hollow when a transform constraint has negative mix. Fixed ghosting for mesh deforms. Added motion vectors to region attachment vertices. Fixed atlas packing during data export always combining subdirectories when Image Folders is chosen. Fixed loading old export settings JSON format. Fixed Import Data with path attachments. Fixed projects on load which have a clipping end slot in the wrong skeleton. Clearing tree text search scrolls to the selected nodes. Hiding a path's slot no longer prevents path constraints from being applied. Fixed Edit Mesh, Generate causing image to disappear when backface culling is enabled. Fixed exporting to the images folder from the CLI. Fixed loading old export settings JSON. Suggest a unique name when duplicating a skin. Fixed naming when duplicating multiple skins at once. Fixed undo after duplicating a skin. Fixed duplicating a skin creating linked meshes where the source mesh is another linked mesh. Fixed Preview crash when adding new timelines during a mix. Fixed crash after deleting the animation playing in Preview. Fixed running texture packer from command line when pack settings file ends with .pack.json. Fixed texture packer settings dialog always showing Current project as checked. Fixed mesh resize prompts not appearing when only the image width or height changed. Fixed specifying -j/--project on the CLI. Fixed non-bitmap font rendering on OS X. Fixed a rare crash when saving. Fixed crash using Import Project - Animation when the project has no animations. Fixed crash with an invalid audio device. Fixed rare crash when dropping a project file on the Spine window. Fixed rare crash with tree text search. Show dialog instead of crash when unable to write export or texture packer settings file. Fixed rare occurrence of an image not being loaded when exporting images or video. Fixed texture packing settings not showing Combine subdirectories as checked. Fixed using export settings JSON in old format. Attachments with Export unchecked are no longer visible in image and video exports. Don't draw clipping, bounding boxes, or points in the Outline view. Fixed Outline showing hidden slots when Shear tool is selected. Fixed blurry Unicode fonts and improved font rendering. Improved where word wrapping occurs for Japanese and Korean. Fixed dopesheet selection box positions when the dopesheet is resized vertically. Remember last bone Split settings. Fixed bone not being selected after bone Split. After deselection, the dopesheet orders the previously selected skeleton first, even when the previous selection had no keys. Fixed bones not following paths for image and video export when the export is done from setup mode. Fixed error about currentProject when running the texture packer. Fixed Preview during mixing when rotation is not keyed on frame 0. Key Offset now respects loop start/end. Fixed whitespace stripping for meshes when using a texture packer scale != 1. Improved saving export and pack settings as JSON when choosing "export" or "pack" as the filename. Better error message when export settings file can't be found. Fixed reading older export settings JSON files. Slightly faster editor loading times. Fixed crash showing a dialog in certain conditions. Fixed texture packing when multiple skeletons or attachments use the same image files. Fixed texture packing whitespace stripping for region attachment images. Fixed texture packing when multiple attachments end with /name. Fixed crash when creating two IK constraints with a cyclic dependency. Fixed crash related to tree draw order. Fixed texture packing Image folders along with JSON/binary export not removing images path from texture region names. When packing multiple skeletons into one atlas, an error is shown if atlas texture regions have the same name. Fixed crash when exporting a texture atlas into a skeleton's images folder. Always set the output prefix when changing the animation to be exported on the export dialog. Assume all PNGs are sRGB (don't apply other gamma). Don't apply PNG gamma if sRGB is specified explicitly. Fixed sRGB being applied twice when a PNG has sRGB specified explicitly. Fixed a crash with the Create tool. Improved selection outline when an attachment is scaled. Search hotkey (enter) selects any existing text. Search - Select All hotkey (ctrl+enter) expands the tree to every selected node. Added a red border to the tree search box when an invalid regular expression is typed. Show hotkeys in tooltips for main toolbar's Options group. Better proposed name when creating a new skin placeholder. Disallow NaN values for JSON data import. Fixed rare crash when choosing a recent project. Added totals to CLI project information. Fixed crash when hiding all animations. Playback Repeat defaults to checked for animations in older projects and is set correctly when a project is loaded. Only hide skeleton and skin names in attachment names. Fixed font rendering for the ! character. Show hotkeys in Views select box. Fixed mesh stripping when a region uses the same image. Don't prompt to move a slot when dropping an attachment on the current slot's bone. Faster start up for CLI usage. Fixed main toolbar button widths when text is not shown. Better text alignment for the Small font. Fixed Japanese, Chinese, and Korean fonts being slightly too tall. Double right click on an animation in the Preview view makes it the active animation for the skeleton. Gray all tree items when a search matches no results. The tree search will now be considered a regular expression if it starts and ends with /. Added Search - Select All hotkey (ctrl + enter by default, cmd + enter on Mac). Fixed numeric sliders not showing the precision if a value is typed. Playback Repeat is now stored per animation (for the editor only). Texture packing can now use mesh UVs for whitespace stripping. Added a Current project texture packer setting when packing a folder to use mesh UVs from the current project for whitespace stripping. Added a CLI parameter (-j or --project) to specify one or more projects to use mesh UVs for whitespace stripping. Hide Combine subdirectories texture packer setting when it doesn't apply (packing only attachment images). Added tree settings to hide skeleton and/or skin names in attachment names. Type-to-select for select boxes with icons. Fixed Settings dialog not resetting to defaults. Orange flash when using key adjust or offset. Fixed a crash when picking a slot for attachments. Fixed tree horizontal scrollbar appearing too early. The tree is more efficient when it has many thousands of nodes. Better export error messages when a file cannot be written. Linear filtering setting now affects ghosts and attachment outlines (much better for pixel art!). Bone scale no longer affects viewport backgrounds. Reduced memory usage for extremely large projects. Removed debug lines from color chooser. Added keyboard input to lists and select boxes: up, down, home, end, and type-to-select. Escape to close a select box, filter button, etc no longer deselects. Fixed flickering and other issues with pixel grid rendering. Fixed crash getting OS language. Fixed dopesheet sometimes not showing overview keys. Added Add Selection hotkeys (shift+0 thru shift shift+9). Added setting (prefs.json only for now) to use the middle mouse button to pan. Greatly reduced project loading times for projects with thousands of attachments. Faster loading of subsequent projects. Faster switching between setup and animate mode. Fixed export preview freezing when settings are chosen which would result in an unreasonably long export. Added scrollbars for export skeleton, skin, and animation select boxes. Improved error messages for debugging. Fixed crash using bone split when the tree properties don't match the viewport selection. Fixed dopesheet not showing new keys when the Show All Bones/Slots hotkey is used. The Preview view is now affected by the Playback view Interpolated button. Fixed export preview border being off by 1px. Fixed crash clicking the Draw Order timeline when bones are hidden in the tree. Better Slot Color view layout when small and for dark color when Tint Black is enabled. Allow transform constraint scale and shearY mix < 0. Fixed duplicating or deleting the root bone with multi selection. Fixed dopesheet crash when locked with row that has no keys and the animation is hidden. Text search box uses less vertical space above the tree when possible. Triggered event are now shown above the selection name if they would otherwise be off-screen. Improved alphanumeric sorting to handle numbers that are not at the end of a name. Fixed audio not loading in some cases for a collapsed or hidden skeleton. Fixed bug where some images were not unloaded when a skeleton is hidden. Improved efficiency for projects with many hidden skeletons. Hiding a skeleton now hides all the tree nodes for that skeleton. Show empty dopesheet rows for selected bones that have no keys. Dim tree nodes that don't match the text search. Stopped dopesheet from flashing when ctrl/cmd is pressed. Dopesheet rows can be dragged to reorder. Hiding slots in the tree now hides Draw Order. Holding ctrl + alt (cmd + alt on Mac) while dragging keys in the dopesheet now does key Offset. 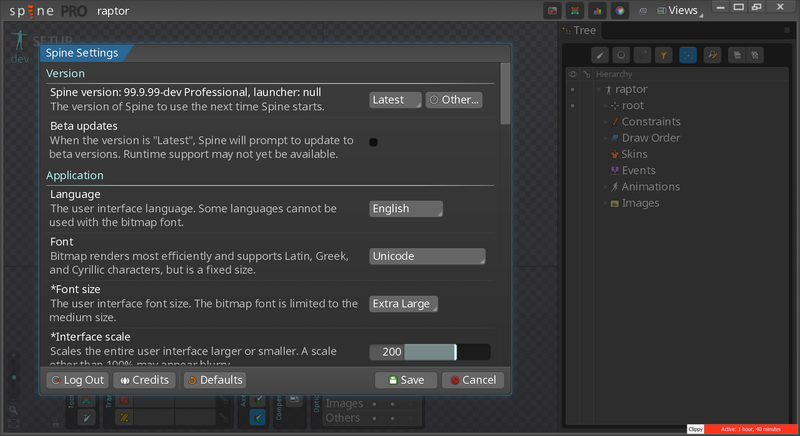 Added type-to-search and type-to-filter to the tree. Fixed tab not focusing the rotate text box. Fixed bad clipping from wrecking the camera. Show bones, slots, and attachments tree filter buttons as selected when the tree filter is active and all types are selected. Attachments tree filter button disables all attachment types when clicked if any attachment filters were active (previously it enabled all attachment types). Hiding slots in the tree now also hides Draw Order. Removed Constraints from tree filter. Fixed crash adding a new skeleton or dragging to reorder skeletons. Added text field focus highlights. Added Tree Filter and Dopesheet Filter hotkeys to toggle filters on/off. All languages have been updated with the latest translations. Update the export preview while dragging the frame slider. Fixed lag when dragging sliders on export dialog. Fixed export dialog not showing "all animations" when "separate skeletons" is chosen. Added Fibonacci setting when splitting a bone. Fixed MSAA export on OS X. Fixed crashes using New tool in Edit Mesh mode when a mesh has deform keys and weights. Fixed crash clicking Files on the Settings dialog. Metrics view considers all visible skins. Respect setting to disable double click in various areas. Categories for the Settings dialog. Fixed a bug when moving a slot to a new bone. Allow right click when picking a parent in the tree. Fixed crash when dropping an image file on a bone. Added an option to move current slot when setting an attachment's parent to a bone. Show dialog when moving an attachment to a bone in the viewport (use tree filter to easily select and move slots rather than attachments). Added back the MSAA setting for the editor (nice for hard edges of region, mesh, and especially clipping attachments). Added MSAA setting for image and video export. Fixed open export when output is prefix. Fixed image and video export not applying deformation when in setup mode. Fixed insertion indicator while dragging a skeleton in the tree. Allow dragging multiple skeletons at once. Added settings for various background types. Allow event a draw order keys to work with key Offset. Toast message when key Offset causes the key on the last frame to be lost. Added dialog to choose behavior when mesh image files change size. Fixed Prune showing incorrect number of weights removed in some cases. Added more Edit Mesh hotkeys. Fixed rare crash pasting keys. Fixed crash creating a skin placeholder for a non-mesh attachment and duplicating the attachment for each skin. Fixed a crash during command line data import. Fixed export dialog preview when a skeleton has no current animation. Potential fix for gray screen after fullscreen -> minimize -> restore for some Windows users. Fixed headless CLI data export. Fixed pasting vertex positions with world axes selected. Added toast messages for copy and paste. The selected vertex positions for mesh, path, bounding box, or clipping attachments can now be copy/pasted. Fixed video export not being able to create a temp file. Offset can now be used with deform, IK constraint, transform constraint, and path constraint keys. Keys that don't support Offset (attachments, events, or draw order) are automatically deselected. Offset is not applied if ctrl and shift (cmd and shift on Mac) are pressed to copy a key. Fixed Offset not allowing multiple changes to rotation keys in some cases. The Mesh Tools view now shows the soft selection brush size and feather in the viewport. Less flicker when resizing the application window. Fixed texture unpacking to restore stripped whitespace. Fixed maximizing the application window with an auto hiding taskbar on Windows. When importing a skeleton, if no attachments are visible, the first skin is made visible. When creating a new region attachment for an image file, the attachment is nudged by 0.5 in each direction with an odd dimension to keep 1:1 texels:pixels when bones have integer world coordinates. Fixed crash exiting Weights bind mode. Fixed crash holding alt when key Offset is used and an overview key is dragged. Fixed crash after deleting an attachment in some cases. Fixed crash pasting event keys after deleting the event. Clicking a file icon in the file dialog now opens the browse dialog in that file's parent folder. Fixed crash duplicating when a name ends with a very large number. Don't give editor focus when clicking SRTH keys. Fixed mesh Scale causing two undo entries. Fixed crash with old launchers trying to start the editor twice. Keep maximized state after minimizing on Windows. Fixed switching to/from Spine when fullscreen on Windows. Fixed CLI exports hanging when the output folder is blank. Fixed CLI data import allowing skeletons to have the same names. Fixed Animations view skeletons select box. Fixed video export and exporting a file per frame. Fixed Preview not displaying correctly. Added Isolate checkbox to Edit Mesh dialog. Fixed the old pose still showing after deleting keys. Force a redraw after maximize/fullscreen/restore on Windows. Go back to losing fullscreen when focus is lost (thread). Fixed double clicking name in the viewport to rename when something else is selected in the tree. Fixed not being able to key meshes, paths, and other items. Fixed undo for dopesheet keys. Fixed mesh, path, bounding box, and clipping attachment world rotation. Fixed export skeleton select box disappearing. Fixed a number of crashes with editing meshes and deform keys. Fixed crash with Update Bindings when multiple meshes are selected. Fixed crash in some case when holding shift to select bones in the Weights view. Fixed a mesh, path, bounding box, or clipping attachment being corrupt after undo in some cases. Fixed issues with multiple selection in the tree. Improved export handling of hidden skeletons and skeletons and animations with export disabled. Fixed crash during undo when applying the tree attachment selection to the viewport. Fixed crash dragging in the Weights view when a mesh has no weights. Fixed crash when clicking a region attachment with the Create tool. Fixed crash hovering a mesh in the tree in certain scenarios. Improved automatic selection of attachments in the viewport based on the tree selection. Fixed dopesheet showing rows during playback as if there is no selection. Added Export checkbox for skins. Editor receives focus after clicking a bone in the dopesheet (eg for pasting a bone transform). Fixed hover of region attachments under a skin placeholder during playback. Fixed clicking a region attachment in the viewport in animate mode (selects in the tree). Added Dim and Triangles checkboxes to Edit Mesh. Fixed key offset being applied when the Offset button is not active. Fixed crash selecting multiple skin placeholders when no skin is active. Improved Find and Replace list UI. Fixed a crash when a skeleton has no bones. Use native file chooser on OS X with latest Spine launcher. Fixed export fit size when only width or height is specified. Fixed open dialog layout issues. Fixed key state after dopesheet jump to start/end. Fixed changing playback speed causing the skeleton to jump. Fixed clicking the timeline during playback when playback speed != 100%. Moved range and crop controls out of preview on the export dialog. Provide a default name when creating a new attachments. Fixed auto key after moving a path position. Fixed export dialog size for data export. Fixed minimum application window size. Ghosting is now drawn before or after each skeleton, not all skeletons. Scrolling for the Ghosting view and collapsed by default. Fixed data export having skeleton width and height as 0 if the skeleton is hidden. Fixed shear Y numeric entry when auto key is active. Fixed rotation numeric entry for world axes when parent bones are scaled or sheared. Fixed scale numeric entry for mesh and bounding boxes not using the selected axes. Added right click Open menu item and open button in titlebar for browse dialog. Added checkbox to keep all attachments when deleting a skin placeholder. Fixed losing fullscreen when the application window loses focus. Fixed fullscreen not being the right size on secondary monitors. Fixed pasting bone transforms to bones with inherited shear or rotation disabled. Fixed pasting bone transforms to IK bones with a different bend direction. Fixed crash when moving slots to a different skeleton using Set Parent rather than dragging. Fixed draw order changing when moving slots to a different skeleton. Increased dopesheet FPS limit to 1000 (to match milliseconds). Timeline zoom range now scales with dopesheet FPS. Fixed crash undoing a new bounding box or clipping attachment. Undo system improvements for stability. Fixed a path control handle getting further away when translating the other handle. Offsetting now selects all keys in each timeline with a selected key. Slightly wider hex color text field. Fixed Edit Mesh not updating triangulation after deleting an edge. Fixed crash deleting a bone used in mesh weights. Fixed mesh keys exporting as stepped. Allow setting any font size in prefs.json. Fixed Preview and Ghosting not showing meshes. Fixed mesh wireframes not moving during playback. Fixed opening very old projects with incorrect paths. Fixed mesh editing in animate mode. Fixed UI transparency rendering issues. Current frame no longer shows decimal during playback. Fixed export preview size estimate for huge files. Fixed crash binding a bone to a mesh. Flash taskbar for longer after an export (Windows). Fixed a crash when changing skins. Fixed JSON and binary export. Fixed opening some older projects. Fixed setting region world rotation. Duplicate for any number and type of selected items. Prune now modifies the mesh as the slider is changed. Added a limit to Prune for the maximum number of bone weights per vertex. Fixed not scrolling to the slot when selecting an attachment in the viewport and bones and attachments are hidden in the tree. Focus text box when clicking outside rename dialog. Import Project can now import multiple skeletons at once. The Animation and Skins views show the tree properties without scrolling the tree (right click still does). Added Duplicate hotkey (ctrl + D, cmd + D on Mac). Fixed rare crash when duplicating a slot. Right click pan no longer stops box selection in the viewport. Right click can no longer select when doing box selection in the viewport. Fixed dopesheet mixing rows from different skeletons. Only show "slot is hidden" export warning for regions, meshes, and clipping attachments. Added Warnings checkbox to disable warnings after JSON and binary export. Rename and delete for any number and type of selected items. Select and Export setting for clipping and bounding box attachments. Select and Export settings when selecting multiple attachments. Set Parent when selecting multiple attachments. Mesh settings when selecting multiple region or mesh attachments. Fixed losing tree selection when hovering a different attachment in the tree. Fixed undo and redo hotkeys happening twice. Update mesh icons when unlinking a linked mesh. Truncation with ellipsis when the tree properties are too narrow. Added title bar buttons for open, save, undo, and redo. Drag Open button in title bar to access recent projects. Reduced memory usage, CPU usage, and project file size, especially for projects which use many deform keys on dense, weighted meshes. Better project unloading before loading another, preventing memory exhausting with extremely large projects. Slightly faster project loading and saving. Only show audio path in animate mode if it is set. Fixed IK timelines being exported with stepped curves. Fixed crash when creating a new skin placeholder for an existing attachment. Fixed event properties flashing when changed in animate mode. Fixed sorting in the dopesheet of color, attachment, and deform timelines. Fixed exports showing all applied skins. Added the Skins view to show multiple skins at the same time. Added options when creating a skin placeholder for an attachment to copy to all skins, copy keys, create linked meshes, and rename the copies. Added option when duplicating a skin to rename the attachments. Flash taskbar on Windows when an export is complete. Fixed bone Z-fighting in some cases. Fixed deform keys not being removed before some actions (eg Generate) if a mesh doesn't have weights. Fixed incorrect triangle lines after undoing Generate. Fixed GIF export dithering and issues with transparency. Allow dragging to change transform constraint order. Fixed bones select box labels after dragging. Fixed GIF playback when set to one time. Fixed attachments incorrectly having a "not found" red X on their icon. Fixed skins select box not showing on export dialog in some cases. Fixed dopesheet not updating when a mesh's Inherit deform is changed. Select default text on all dialogs. Duplicating a skin can create linked meshes. Duplicating a skin can also duplicate deform keys. Fixed some GIF animations not exporting. APNG export improvements and optimizations. Fixed project files with invalid path constraint bones. Adjust relative paths when importing a project into another to keep the same images and audio paths. Don't look in application working directory for relative image and audio paths. Fixed crash using Set Parent to move bones to a different skeleton. When choosing New > Bone with shift held, the parent bone remains selected (like it does with the Create tool). Fixed crash when pasting keys if the slot or bone for the key has been deleted. Fixed balance for mono audio files. Fixed export dialog not showing last background color. For export, checking Others now includes names, if they are visible. Fixed GIF export having a black last frame. Path handles are no longer considered for export bounds. Fixed audio playback after pressing last key and jump to start timeline buttons. Fixed bone shear for Data Import. Fixed Preview showing tint black after it is removed from a slot. Fixed failure to read some MP3 files. Added hold previous button to Preview. Added events list with colors to Audio view. Fixed audio keys being drawn incorrectly in the dopesheet. Added Repeat Last Texture Packer hotkey (ctrl+shift+P). Fixed audio playback when changing between animations playing the same audio. Fixed selecting an event marking the project as unsaved. Fixed event key state after pasting into String field. Added "hold previous" button to Preview view. Fixed crash opening export dialog. Fixed zoom to fit and zoom 100% when interface scale > 100%. Fixed losing selection when ctrl/cmd + clicking a selected attachment with the Create tool. Fixed artifacts on color dialog and Slot Color view. Slightly faster application start up. Added choosing an audio output device to the Audio view. Weights view checkboxes now select the Weights tool instead of being disabled. Fixed crash using ctrl/cmd to add different types of attachments to the same selection. Fixed smart selection rules for bounding boxes, paths, clipping, and point attachments. Fixed point attachments not showing as selected with the Create tool. Prevent changing the horizontal scroll position when the timeline is zoomed. Prevent timeline zoom to fit from zooming in an unreasonable amount when the view is wide. Added volume to Audio view. Allow setting colors for multiple attachments at once. Increased Current/Start/End text box widths in the dopesheet. Fixed orange frame number when dragging dopesheet keys when scaling a selection smaller. Improved timeline zoom slider and UI padding. Improved handling of tabs that are smaller than their contents. Fixed bug with Combine subdirectories when packing a texture atlas. Added Compress and Uniform settings to 1-bone IK constraints. Fixed data import not seeing stretch in IK timelines. Greatly improved font rendering when interface scale is >100%. Fixed mesh and path editing when interface scale is >100%. Changed default texture packer max size to 2048. Fixed texture packer progress when packing many folders. Fixed crash when zooming the Audio view in some cases. Fixed crash when exporting video which has audio longer than the video. Detect OpenAL audio initializing correctly but not being able to start playback. Fixed right clicking a track button in Preview not using that track's settings. Fixed dragging bone length being able to change tree item visibility. Right clicking a visibility dot now uses a single undo entry and is much faster. Fixed off-by-1px problem with vertical scrolling in the Dopesheet. Fixed stepped dashed line before first key not appearing for color timelines. Fixed New Animation button in Animation view not working when a skeleton has no animations. Fixed saving JSON and binary projects after doing an export with texture packing. Added export setting for JSON and binary to 1) pack only attachment images or each skeleton's image folder, and 2) to output a single atlas or an atlas per skeleton. Fixed export dialog not remembering output path. Fixed Preview changing animations when a different track is selected. Fixed Spine launcher (3.7.28) not running on some Windows computers. Better consideration of bones when calculating skeleton bounds. Various Spine launcher improvements (3.7.27). Fixed audio being shorter than video, causing a desync when looping in some players. Prevent losing the selection when dragging on a region attachment in animate mode. Fixed video + audio exports with a range. Fixed crash during texture packing. Show dialog instead of crashing if texture atlas unpacking fails. Fixed binary export not writing stretchy IK boolean for IK timeline keys. Pad setting for export Size: Fit. Fixed loading range and crop export settings (from JSON and last exported). Fixed various export dialog bugs. Remove extension when choosing the wrong export file type. Added hotkey to open a project, bypassing the favorites dialog (ctrl+shift+O, cmd+shift+O on Mac). New Spine launcher, 3.7.23 (requires manual download and reinstall). Improves overall performance, highly recommended. Fixed resampling when exporting video with audio (requires new launcher). Fixed crash double clicking an attachment while holding ctrl with the Create tool. New, powerful image and video export with preview, cropping for cutscenes and cartooning, and more. Advanced, high quality GIF export settings. Added APNG and PSD export. Added skeleton and animation Export checkboxes. Added an animation clean up option for JSON and binary export. Added a Stretch checkbox to IK constraints. AVI and MOV now support audio. Create tool is no longer limited to selecting only one bone. Fixed crash doing CLI animation clean up for some projects. Fixed rare Create tool crashes. Increased pose tool rotation speed when only one bone is selected. Fixed icon select box crash on mouse down. Fixed the key selection state when a dopesheet row is collapsed. Fixed launcher progress bar (3.7.19). Fixed multiple "Export complete" toasts when exporting all animations. Enabled panning in Preview view with left click. Fixed bug where Pan Drag (J) would activate without pressing the mouse. Fixed drag indicator being drawn over tree expand/collapse icon when bones are hidden in the tree. Fixed transform constraint Match rotation offset. Fixed zoom after New project. Added Mesh Tools view tooltips. Export bounds now respect clipping. Removed MSAA setting (antialiasing is always used). PNG sRGB and gAMA chunks are respected. Added Divisible by 4 setting to the texture packer. Clicking in a blank space in the dopesheet now stops playback (timeline doesn't). Fixed checkers showing very faintly in color dialog with 255 alpha. Fixed texture packing progress bar when there are multiple skeletons. Added a setting for backface culling. Fixes from 3.6.53 (important stability fixes). Improved dopesheet performance for projects with 15k+ keys per animation. Fixed crash clicking Browse for a folder on Import Data dialog. Fixed CLI exports not writing files. Using tab to select the next text field now always selects all the text. Fixed hang after CLI data export. Fixed launcher not recognizing some parameters (new launcher version is 3.7.18). Print warnings when loading projects for the CLI. CLI animation clean up can take a folder of project files. CLI export can now take a folder of project, JSON, or binary files. Added CLI parameters to import a project, JSON, or binary file or folder into a project. Zero padding on filenames when exporting PNG or JPG sequences. Fixed texture packer padding causing images to be too large. Fixed JSON pretty print running out of memory with large (15MB+) JSON files. Fixed undo when clicking Auto in the Weights view. Fixed Zoom 100% not resulting in 1:1 pixel zoom in some situations. Fixed path tangent dashed line scaling. Fixed paths breaking when handles are moved. Reversing keys using box select now also reverse the curves. Fixed CLI JSON or binary export when Create atlas is checked. Added CLI parameter for showing project information. Tooltips for bone transform inherit properties. Fixed Preview track buttons staying orange after loading a new project. Unload images and audio for hidden skeletons. Improved dopesheet tick spacing for various font sizes. Prevent tree spacing from changing before restart when font size is changed. Fixed path fixed position, fixed spacing, and percent spacing when the path bone is scaled. Drag indicators in for constraints and draw order tree nodes. Use 0 if GIF repeat is set to blank. Fixed blurry dashed triangle line for Edit Mesh. Fixed adding the same bone multiple times to a path or transform constraint. Fixed Key Shift when moving white keys. Dopesheet no longer shows white keys in the first row as selected unless all keys are selected for the frame. Allow right mouse button to pan Audio view waveform. Fixed tab focus for modal dialogs. Fixed favorites file dialog staying open. Favorites file dialog is not shown if it contains only the current entry. AVI export now includes audio. Fixed slot select box in existing slot dialog. Fixed distance required to start dragging vertices when zoomed in. Fixed a hang and some bugs when a mesh, clipping attachment, etc has zero scale. Slot Color view no longer shows color chooser when no slots are selected. Fixed being able to change 2-bone IK to have a bone with disable inherit rotation or scale. Fixed crash when using clipping with many thousands of vertices. Key Color hotkey works when a bone is selected, if the bone has a single slot. Key Color hotkey works on multiple slots (and bones with one slot). New -> Bone now creates at the new bone at the parent bone's tip (convenient for creating an IK target). The stepped transition from the setup pose to the first key is indicated with a dashed line. Increased decimal places on main toolbar for translation values >= 10 and < 1000. Dopesheet row sorting keeps slot color, attach, and deform timelines together. When a project has multiple skeletons, after deselection the dopesheet shows keys for all skeletons instead of none. When texture packing using combineSubdirectories, any subdirectory containing a pack.json file will not be combined. Fixed export JSON "class" field. Export mesh with linked meshes even if Export is unchecked. Fixed load/save dialog titles on texture packer settings dialog. Always change the skeleton name when choosing a JSON file for Data Import. Allow specifying a folder of JSON or binary files for Data Import. Remember last settings for Data Import. On Windows, open Data Import when dropping a folder containing JSON or binary files on the Spine window. Improved Edit Mesh triangle line rendering and colors/dimming. Added a Viewport pixel grid scaling setting for pixel art skeletons. When hiding a bone, the bone's keys are hidden in the dopesheet when otherwise all keys would be shown. Fixed crash when creating new path if clicking twice in the same position. Edit Mesh hotkey now changes a region attachment into a mesh. Added a tree indentation setting and increased default. Fixed crash setting up views for the first time. Fixed out of memory error when exporting. Added out of memory dialog during export. Fixed slots not having tint black after data import. Added dashed lines for arrows and other lines. Fixed alpha for motion vector colors. Warning when trying to move vertices outside the hull when Deformed is checked. Allow bone scale setting up to 8. Improved zooming and panning with larger bone scales. Added motion vector options to Ghosting view. Fixed crash converting recent files from prefs.json to recent.json. Fixed crash saving texture packer settings. Disallow .png as a texture atlas file extension. Normalize waveform in Audio view to take up full height. Fixed playback speed when no audio is playing. New Preview additive and remove icons. Added Resample setting to texture packer scales. Fixed image and audio file watching. Fixed animate mode tooltip always showing at startup. Added icon overlays for mesh attachments, region attachments, image files, audio events, and audio files when the image or audio file is missing. Added visibility dot to events to disable playing audio and showing the event name in the viewport. Fixed transform constraint match shear offset. Fixed transform constraint match when local is checked. Added Audio view to show audio waveforms. Fixed timeline frame number color when setting loop. Cleaner shutdown of audio system. Fixed exporting skeletons with names that are invalid for the file system. Allow dragging audio file to Events node to create a new audio event. Fixed undo for moving audio event keys. Fixed warble while dragging after moving audio event keys. Increased initial width of the Preview view. Added an "additive" mode to tracks > 0 in the Preview view for morphing and combining animations in new ways. Delete JSON/binary file before exporting to reflect case change in skeleton name on Windows. Moved recent files and view layouts out of the preferences JSON to separate files. Merged fixes and improvements from 3.6. Fixed message about audio files not being loaded. Fixed audio warbling when scrubbing, especially for small files. Fixed decoding some OGG audio files. Fixed keys disappearing at the left edge of the dopesheet when the timeline is zoomed out. Important stability fixes for the dopesheet, mesh editing, and other areas. Better error messages when a project file can't be loaded from the CLI. Fixed Weights view Direct mode controls just after Spine is started. Fixed a key's curve being set to linear after moving keys twice with Offset enabled. Fixed path handles not mirroring correctly. Fixed issues with input events on OS X. Fixed transparency in the editor when using tint black. Fixed new bones with length > 0 having a non-bone icon. After binding bones, fixed Auto weights only considering the one selected bone. It still uses the selected bones when Auto is clicked. Auto weights with selected vertices or bones shows a toast as a warning. Unknown hotkeys (often from newer versions of Spine) show a toast instead of a dialog. Fixed crash creating a new path. Fixed image export sometimes being 1 pixel too large. Changed back to always showing pies for unselected vertices. Paths that are not closed show straight lines for before and after the path when selected. When specifying a .pack.json file for texture packing at the command line, the .pack.json extension is stripped when the file name is used for the texture atlas name. Fixed texture packer JSON writing a name attribute, which caused the JSON to fail to load when used as pack.json in image folders. Fixed crash in edit mesh mode while dragging from hull vertices with Create tool. Fixed visibility dots changing when dragging items in the tree. Fixed not being able to drag an image file to a slot if tree filters are hiding bones. Fixed clipped image and video export bounds. Fixed crash creating a skin placeholder on a bone. Fixed warning on Windows when exporting a skeleton with images in subfolders. Fixed deleting existing texture atlas files in scale subfolders. Prevent invalid project files from being included as recent files. Delete bones with invalid skeleton on project load. When moving bones, slots, and attachments across skeletons, crash immediately if the move was incorrect to allow finding the reproduction steps for the bug. Fixed crash moving bones, slots, and linked meshes across skeletons in some cases. Fixed wrapping for next/previous frame hotkeys (R and F). Fixed next/previous key hotkeys (Q and E) not updating transform key buttons. Fixed warning on Windows that an image cannot be found when it doesn't have a lowercase file extension. Fixed warning that images were already packed when using scales and packing multiple times to same directory. Creating a new constraint now suggests a name, using the target. Less mesh UI clutter when adjusting weights, especially with pies disabled. Update Bindings now works with multiple meshes selected. Fixed linked mesh in skin placeholder being moved to a different slot without also moving the source mesh. Fixed bugs with moving a skin placeholder with a linked mesh to a different skeleton. Fixed bugs where after deleting a skin, the skin remained active. Fixed mouse events at the very top of the window from being accepted by tools. Fixed pasting deform keys to an attachment under a different bone. Fixed crash clicking Update Bindings without a weighted mesh selected. Fixed Weights view not having a weight painting tool selected by default. Improved keeping the mesh position when removing deformation for: Reset in the tree properties in setup mode, Reset, Generate, and New in edit mesh mode, and when converting a mesh to a region. Fixed some actions being combined into the same undo step. Auto key works for mesh reset. Fixed undo state showing as edited when a project is loaded. Fixed parsing JSON which uses \r (CR) for EOL. Fixed the images path from being set to the Spine installation folder when saving a project for the first time or with Save As. Fixed crash opening some very old projects. Fixed problem which hid actual crash cause. Direct is now the default tool on the Weights view. Adjusting bones in setup mode no longer adjusts the bind pose, preventing mesh corruption. Added an Update Bindings button on the Weights view to store the correct mesh vertices as the mesh's bind pose. Fixed color dialog RGB values changing when losing focus. Fixed crash using zoom to fit or zoom to 100% when no skin is visible. Fixed crash importing some data files or opening some projects. Fixed vertex count on edit dialog when creating a new clipping attachment. Fixed transform tools when the bone closest to the root is fully controlled by a constraint. Fixed hotkeys.txt being kept open while Spine is running. Show icon at drag position for direct weight tool. Fixed opening some extremely old projects. Changed how zoom to fit works when bones/images/other are hidden. Fixed zero scale on bones causing the Spine camera to fail. Fixed texture packer dialog not showing last output folder. Added Tree Up alt + up, Tree Down alt + down, Collapse alt + left, Expand alt + right. Fixed color keys with FF alpha changing to FE after project reload. Fixed Animations view not selecting the skeleton to match the viewport selection. Fixed tab traversal on some dialogs. Fixed undo not recording a state in rare cases. Fixed typing numbers on color dialog being entered backward. Fixed filtering artifacts on hotkey popups. Prevented attachment names changing position when ctrl is pressed. Fixed crash selecting multiple different kinds of attachments when attachment names are enabled. Fixed skin visibility when duplicating a skeleton. Fixed skeleton tree expand state not being remembered when loading a project. When creating a new path and dragging the second handle, the first handle is adjusted to make for a reasonable path. Fixed skin alpha sorting after rename or Find and Replace. Fixed crash when right clicking to remove an entry from a file dialog. Fixed right clicking to remove an entry from a file dialog sometimes not working. Fixed saving a project during exit not closing Spine afterward. Fixed Set Parent for bones and slots not being able to choose targets in a different skeleton. Fixed crash using Set Parent for images (not attachments) and choosing a target in a different skeleton. Fixed images path when set to ".". Fixed image preview in the tree when the image is larger than the Spine window. Fixed crash when creating a bounding box or clipping attachment and New is clicked before any vertices are created. Fixed Import Project browse button showing favorites. Show launcher cancel button during update check. Fixed rotate and scale compensation when both Bone and Image compensation are enabled. Use file name for default skeleton name on Import Data dialog. Fixed zoom to fit after doing Import Data. Fixed New not clearing the vertices on the bounding box Edit dialog. Fixed animation names being shown in brackets during Import Project. Improved the resulting mesh position after using edit mesh Generate. Fixed selection group hotkeys not scrolling the tree to the selected nodes. Fixed Project Import animation when two placeholders in the same slot have attachments with the same name. Fixed meshes with Wireframe checked being drawn in mesh edit mode when deform is unchecked. Don't animate mesh rotate tool unless changing vertices. Fixed keeping attachment transform when moving a skin placeholder to a new bone. Fixed exported data not having skeleton size in some cases. Improved error handling during exports. Export script improvements (next launcher update or at spine-scripts). Added AE and Inkscape export scripts to launcher download (next launcher update or at spine-scripts). Default bone name for new bone uses parent icon and parent name as prefix. On Windows, can drop a .json, .skel, .spine, or .atlas file on the Spine window. Hovering the visibility dot or key in the tree no longer temporarily shows the attachment. Use absolute path for images folder when doing Data Import into a new project. Fixed weights slider on the Weights view for Direct mode. Fixed error opening some old projects. Fixed Ghosting view alignment for non-English languages. Changed default prune value to 5.5. Fixed clicking bone rotation checkbox when disabled in animate mode. Fixed button icon scaling at small and medium font sizes. Fixed minimum height for Timeline and Playback views. Added skel.bytes extension to Import Data. Fixed invalid project state in some cases from dragging across skeletons. Better error messages are logged for WAV files. Fixed tree not scrolling all the way down when the project has many skeletons. Fixed file dialogs not remembering network paths. Fixed image file used icons after dragging into viewport. Fixed dragging image file when toolbar is next to the tree. Show mouse over for region attachments in animate mode. Fixed crash dragging vertex in mesh edit mode. Fixed crash right clicking a Preview track button before an animation is selected. Fixed crash moving path position in animate mode. Fixed right click delete of first item on export file dialog not deleting. Fixed adding a new key preventing existing curves from being applied. Right click Preview track buttons to toggle the last played animation. Fixed Visibility hotkey for bones. Fixed Set Parent hotkey for path and point attachments. Fixed crash creating clipping attachment with Preview open. Fixed undo allowing a bounding box or path to have zero vertices. Fixed crash dragging a slot with a path to two different bones. Fixed point attachments not showing their name when under a skin placeholder. Slot color dialog and Slot Color view apply auto key has the color is changed, to better work with Preview. Fixed Auto weighting when a linked mesh's vertices are selected. Added Limit memory texture packer setting. Can now select any number of bones, click Bind on the Weights view, then choose a mesh, bounding box, path, or clipping attachment. Focusing a text field no longer prevents ctrl + ? hotkeys. Added a vertical line to denote the original start/end when using key Offset. Added Current skin scope to Find and Replace. Removed square brackets from bone names in bone select boxes. Added Cancel button to export progress dialog. Fixed difficulty selecting bones with a pen while holding ctrl (cmd on Mac). Edit button to choose new constrained bones and target for transform, path, and IK constraints. Show linear line on Graph. Added a progress bar to texture packing. Fixed images showing "loading" placeholder during key Offset. Don't show parent bone arrows for hidden bones. Colored track button when playing an animation on that track in Preview. Fixed minimizing a view with more than one tab. Optimizations for projects with many Bezier keys. Fixed file dialog not opening in some cases. Fixed Find and Replace not finding the right object types. Added clipping attachments to Find and Replace. Fixed ctrl exiting New clipping attachment mode. Fix projects on load that have attachments in a skin that has been deleted. Fixed hotkeys on OS X. Fixed Show All Bones/Slots hotkey not updating the tree. Fixed misaligned icons on minimized view buttons. ctrl + alt + click removes a vertex from soft selection. ctrl + alt + drag removes vertices from soft selection with box selection. Added Hull vertices checkbox to Mesh Tools view. Added First option to the Find and Replace dialog. Fixed slot blend mode being changed when multiple slots are selected. Loop, mix, and alpha are stored per Preview track. Fixed crash when adding a key to new animation with Preview open. Fixed crash opening file dialog. Fixed missing and loading placeholder images not using the right texture filtering. Fixed maximize/fullscreen size when using multiple monitors. New hotkey Show All Bones/Slots, defaults to ctrl + H (cmd + H on Mac). Fixed crash deleting slots/bones/etc with Preview open. Warning if exporting JSON/binary and creating an atlas under a skeleton image folder. Warning on export that attachment image file is missing if it has different case on Windows. Fixed Preview crossfading on track 0 when the second animation doesn't key a value on frame 0. Import Project file dialog shows recently opened project files. Separate favorite and browse dialog buttons. Fixed Wacom modifier key events. Optimizations for projects with many attachments (75,000+). Fixed Create tool being unable to drag the new bone the first time. Fixed selection groups containing a slot from selecting the parent bone in the tree. Added -m / --clean CLI option to perform animation clean up (requires 3.6.25+ launcher). Fixed OS file dialog not showing in correct directory. Fixed project undo state after deleting entry from file dialog. Fixed dragging a bone and descendants to another skeleton. Fixed crash editing a mesh while using Preview. Fixed key Adjust so it still works when Auto Key is off. Fixed Preview not seeing a longer or shorter animation. Fixed directory appearing in files list on file dialog. File dialog no longer shows entries when the root of a path (usually the drive) does not exists, even when a path isn't required to exist. Export dialog shows file extension that will be added when one is not specified. FPS now shows "--" until the FPS is ready. Added button in dopesheet to show/hide Graph view. If Graph is a tab, the active tab is toggled instead of hiding the view. Key Offset when the first and last keys are not the same value is disallowed. Fixed events being triggered incorrectly when loop start/end was used. Fixed curves when using Key Offset. Fixed orange frame number in timeline when dragging < frame 0. When a new animation is chosen in the Preview view, immediately load images for attachments shown in the animation. Press spacebar or alt+B on any file dialog to browse. Fixed ghosting affecting Preview view skeleton color. Added Next Skin and Previous Skin hotkeys (default: , and . keys). Improved Next Animation and Previous Animation hotkeys for projects with multiple skeletons. Fixed Preview and Animation views' skeleton select box. Fixed dopesheet vertical scrollbar width. Preview view improvements and bug fixes. Added Preview view for playing back animations with mixing inside Spine, similar to Skeleton Viewer. Fixed dragging image files to a slot. Fixed path constraint position when dragging handle along the path. New hotkey, Main Menu: alt+F. Can be followed by a letter, O for Open Project, S for Save Project, etc. Linked mesh properties now show source mesh skin, if any, and clicking the source mesh makes the skin active so the source mesh can be selected. Restrict Timeline view height so it doesn't look broken. Fixed attachments abandoned in old skin when a bone is moved to a different skeleton. Allow pasting a file as a path into text boxes. Pasting a file to a file dialog will choose that file. Right click to remove a path from a file dialog. Fixed file dialog when UI animations are disabled. Fixed bone selection after dragging a bone to a different skeleton. Fixed images not loading for attachments shown mid animation. Fixed crashes creating new attachments. Fixed attachment not showing when creating a new slot + attachment at the same time. Bones, slots, and attachments can be dragged to a different skeleton. Duplicate now prompts to also duplicate keys for bones, slots, attachments, and events. Fixed polygon compensation when moving a bone that is a child of a bone that is constrained. Favorite projects are no longer listed first on Recent Projects menu. Pressing enter on a file dialog chooses the most recent. If filter text is entered, it chooses the first entry. Fixed losing attachment visibility when undoing moving an attachment to a different slot. Fixed Link sliders for transform constraint being disabled in animate mode. Added hotkeys Auto Scroll (equivalent to tree button) and Scroll To Selected (for when auto scroll is off). Fixed vertices not being updated in edit mode if the attachment isn't visible. Fixed some problems with undoing changes to keys. Fixed changing key curve type in graph not having an affect. Changing beta setting prompts restart. Allow dragging multiple attachments with different types at the same time. Fixed duplicating a bone or slot that has linked meshes. Attachments automatically renamed by moving linked meshes to another slot now have their path set so the image can still be found. Fixed dragging linked mesh on to source mesh when source mesh is under a skin placeholder. Fixed draw order not showing correctly in the tree. More detailed log messages when projects load with warnings. Pressing ctrl (cmd on Mac) over UI widgets no longer triggers a mouse over in the viewport. Fixed crash showing main menu regarding the recent projects submenu. Fixed Save As not working the first time. Fixed loading color keys in very old projects. Fixed crash using undo when hovering tree node. Huge performance improvements for projects with many attachments. Loading dialog when opening project via Recent Projects menu. Fixed crash keying an event. Fixed not being able to selected vertices in mesh edit mode after the Spine window forcibly loses focus. Draw deformed boundary lines for multiple vertices in mesh edit mode. Improved deformed mesh edit mode when dragging multiple vertices and hitting the boundary lines. Animated returning mesh vertex rotate tool icon to 0 degrees. Fixed scale tool icon not changing size for mesh vertices. Fixed selecting a second mesh when box selecting vertices. Fixed Hide Selection hotkey to hide vertices during manipulation. Fixed crash during project Save As. Fixed rendering while project loads after choosing a file from the file dialog when Spine is maximized or fullscreen. Fixed default interface scale on high DPI (2x+) displays. Added loop selection: hold shift when clicking an edge. Tree highlighting for linked meshes. Faster AVI RAW and MOV RAW video export. Remember selected bones in Weights view. 4K support for Skeleton Viewer. Convert paths stored in project file to the new open dialog. Icon for main menu recent projects list. Increased item spacing for main menu and select boxes. Rounded edges and blue down state for select box selection. Fixed clipping ghosts when ghosting only selected attachments. Metrics view shows clipping metrics. Fixed color keys when opening projects from before 3.6. Significant performance improvements, especially with mesh manipulation and undo/redo. Fixed video with alpha export, supported codecs are AVI RAW, MOV RAW, MOV PNG, and MOV Animation. Fixed slot color with zero alpha affecting clipping. Don't fill background when clipping is selected and Others are hidden. Icon for clipping end slot Set button. When creating a slot for clipping, put it at the bottom of the draw order. Clipping end slot defaults to same clipping attachment's slot (which clips until end of draw order). Colored background in draw order to denote clipping. New file choosing dialogs and smart logic. Save Project As updates the skeleton image paths relative to the new project file location. Added Wireframe checkbox to meshes to always show the vertices and edges. Prevent flashing of Pies checkbox and bone dimming when dragging with Weights tool. Selected checkbox on Weights view is now useful even when no vertices are selected. Selected checkbox only shows pies for selected bones and vertices. Added "select vertices" button to bones list on Weights view. Preserve background color alpha when choosing image export formats. Fixed tree filter for attachments. Fixed clicking slot label when bones are hidden in tree. Added clipping attachments for polygonal clipping areas. Fixed tint black checkbox when multiple slots are selected. Fixed tint black when duplicating a slot. Update path constraint properties after dragging path position in viewport. Fixed confusing UI state when playing an animation with no keys or all keys on frame zero. Added separator between skeletons in the tree. Fixed default UI scale for 4K (2x scale). Fixed scrolling to selected tree node in some situations. Allow selecting region attachments in the tree in animate mode by clicking them in the viewport. Fixed tint black with ghosting. Remember tint black setting when disabling tint black. Fixed ghosting showing attachments hidden in setup pose. Fixed texture unpacker dialog size. Fixed dopesheet losing selection when the active tool is changed. Fixed undo for changing attachment colors. Fixed auto weight crash for Mac and Linux. Fixed images not being packed during data export if their name or path has a file extension. Fixed Import Project, Animation when the source project has a region and the importing project has mesh deform keys. Fixed crash when editing bounding boxes in animate mode. More audio playback improvements. New play.jar uploaded. Much higher quality font rendering when using Interface scale. Added Interface linear filtering setting to disable linear filtering when using interface scale. Better initial settings for 4K displays. Texture packer whitespace stripping now leaves 1px of whitespace on image edges that were stripped when duplicate padding is used. Added back Reuse instance setting for Windows and Linux. Hid Keyboard type for Windows and Linux. Disabled changing the Spine version in the trial. Fixed manipulating bones in setup mode for linked, weighted meshes. Improved Scale tool when dragging to adjust both axes and one is negative. Fixed non-shadowed bitmap font render position. Added Spine version to export dialog. Duplicating a slot now changes viewport selection to new attachment. Audio server improvements, loop audio when looping animation. Don't draw paths in outline view. Added language: Traditional Chinese. Requires new launcher. Fixed being able to undo changing the background color in the Settings dialog. Added point type to Find and Replace. Fixed Auto mesh weighting for a coarse mesh with very small bones. Don't write bone rotations outside the -180 to 180 range in export data. Better Bone -> New constraint UI. Auto weights now only modifies weights of selected bones and vertices. Select none for all. Added local and relative options to transform constraints. Graph view now hides text on buttons and labels when resized smaller to reduce its minimum width. Holding shift when creating a new bone via hotkey or the tree creates the new bone as a sibling of the selected bone. Removed ability to create a Skeleton Attachment, which is a WIP and not yet ready. Fixed tree selection order when shift clicked from bottom to top. Fixed image compensation for child meshes. Fixed New select box being disabled when selecting multiple bones. Mouse over glow for weight pies. Changed how meshes, paths, and bounding boxes are adjusted and how image compensation is applied to them. Fixed shear compensation for meshes. Removed shear compensation for bones, as it didn't work right and doesn't make sense. Fixed mouse cursor on text fields in dialogs. Better tree node expansion when doing box select. Fixed selected tree node being scrolled under the tree properties. Added Select checkbox to bones. Fixed exporting attachments with file extension in their names. Hiding a bone in the tree no longer hides dopesheet rows. The events node and individual events in the tree no longer hide dopesheet rows. Hiding events using the dopesheet filter now also hides the events in the viewport, above the skeleton. Added texture unpacking to CLI. Export warnings when a slot is hidden. Export warnings when a project contains a mesh and Create atlas is checked. Better warning messages for multi-skeleton projects. Added Tint black for slots. Requires special runtime support. When setting a key, use the constrained local transform if the property being keyed is controlled 100% by a constraint. Tooltips move with the mouse and are shown above the mouse so they can be more easily read. Buttons on right edge of tree show a tooltip with the name of the constraint. Items related to the selected item in the tree are highlighted. Related items are highlighted when buttons on right edge of tree are hovered. Show tooltip animation duration reduced (hover time unchanged). Draw arrows between bones when hovering buttons on right edge of tree. High quality antialiased line rendering, even without MSAA. Mouse over with Create tool shows only arrows up hierarchy to the root bone. The changelog for older releases can be found in the changelog archive.